Is my Ash tree is dying? It was springtime when I received this phone call from a client. Hmmm, I thought to myself, what could this client possible be thinking since there is no such thing as “Sudden Ash Disease”? I knew about Sudden Oak Death, but I wasn’t sure how he was relating that name to an ash tree. Suddenly all the pieces began to fall into place. “Could they have been talking about the Emerald Ash Borer?” The Emerald ash borer is a non-native pest that had been devastating the ash trees along the east coast and was slowly making its way west. Of course, being from California he was well aware of Sudden Oak Death, a fungus that had been wiping out stands of oak trees along the west coast. 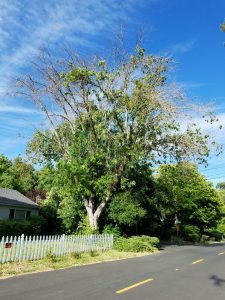 It made sense that he would meld these two devastating diseases together to explain why his Modesto ash looked so poor. I told him that I his ash tree didn’t have Sudden Ash Disease, though that label was a pretty good description of what he was probably seeing on his tree. His concern was that even though it was mid-May his ash tree had very few leaves and all the other trees were lush with new foliage. I explained to him that ash trees, and especially Modesto ashes are very susceptible to a foliar fungus called Anthracnose. Anthracnose is spread by water and attacks the newly emerging leaves in spring. It is especially harsh on trees when we have a very wet spring. I told him that the fungus can’t survive in hot dry weather, so once our normal California hot, summer heat arrives (usually around the 4th of July) the fungus dies out, the tree drops the curled, burnt leaves (because it can’t photosynthesis with them) and produces new leaves. The disease is rarely fatal and that his tree would survive. To help make him feel better I told him to look at all the other ash trees in his neighborhood and he would see that all the other Modesto ash trees looked just like his.